First of all, NYCC was great and I'll have an in depth post about my trip soon but for now I wanted to share something else. On my way back from New York I made a stop in Philly for a night and got to go on a Halloween Haunt at Terror Behind the Walls at Eastern State Penitentiary. Some of you probably know that back in my last semester of college my senior class participated in a project with Eastern State to pitch projects for their Halloween Event and I was one of two lucky students who had their work selected. Due to this partnership I and the other students from the Uarts 2012 Illustration class as well as the current Uarts Illustration seniors were treated to a trip through the Halloween haunt as well as a private gathering with some snacks and a display of some of last years work which was created for the penitentiary. All in all it was a good time and it was great to see some of my friends from school. 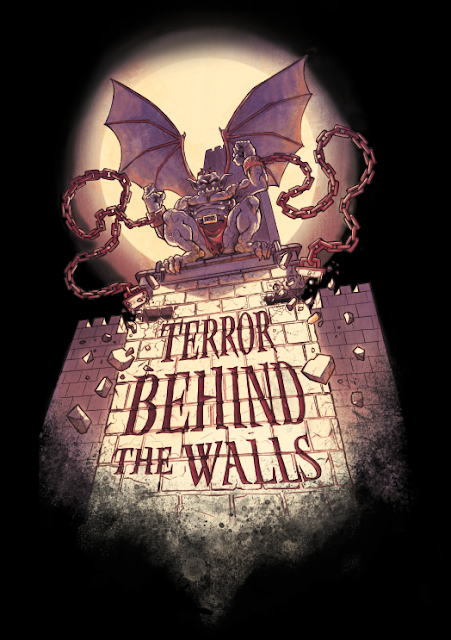 Below is the image i created for Terror Behind the Walls and some pictures from last night as well as a few pictures from when I received my shirt samples. 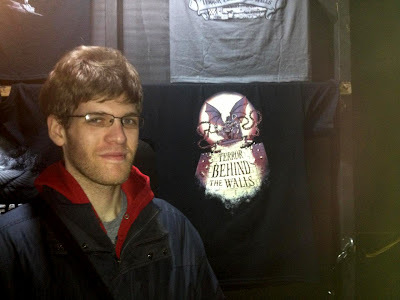 Me standing next to a display of my shirt! The gift shop with my shirts as well as the shirts designed by a fellow Uarts grad! Creepy guy standing next to the shirts. Private gathering with some of the art done for Eastern State by other students. Me with a weird look on my face and excited that I have 2 shirts! Be sure to stay tuned for my experience at NYCC!